When children experiment with paint, they think more is the answer. If one coat of paint looks good, surely two, three or four will be better. By the end of their artistic endeavors, instead of a masterpiece they have a mess as the paint dries and slowly flakes away. Two fast food restaurant chain locations in Indiana ran into a similar problem with their parking bumpers. Each year another layer of paint was added to the bumpers. The process was tedious and time consuming. Unfortunately, after years of re-coating, the bumpers were an unappetizing, flaky paint mess. Patrons arriving for a meal were confronted with this unappealing first impression. They turned to us for a better solution. We introduced the restaurant to our custom hard plastic parking bumpers. 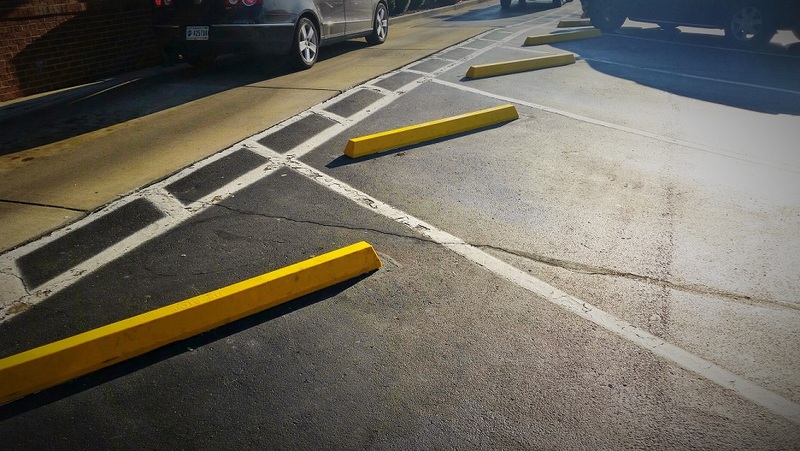 These innovative parking bumpers look exactly like the traditional painted bumpers without the hassle of yearly repainting. Each bumper consists of a hard yellow plastic shell which is filled with concrete. The durable plastic bumpers won’t flake with wear, and never need repainting making them a terrific alternative to classic concrete parking bumpers. In Lafayette, IN we removed and hauled away 20 aging parking bumpers. Then we produced, delivered and installed 20 new bright yellow curb stops. At their second location in Castleton, we installed another 15 parking bumpers with the same process. Both locations now have new, non-flaking plastic parking bumpers. As guests arrive to enjoy a meal, they will no longer be distracted by the unappetizing peeling paint, reminiscent of a child’s art project. Instead, they will have a clear and easy visual to aid them in parking their cars so they can focus on the meal they came to enjoy. Want to learn more about our innovative plastic parking bumpers?